Former Chester goalkeeper, Brian Biggins, died earlier this month. Our condolences go out to his family and friends. Brian Biggins was born in Ellesmere Port on May 19th 1940 and was only 16 when he first appeared for the Reserves, in September 1956, following an injury to Keith Griffiths. Brian himself had previously been playing for Hoole Alex. Juniors and went on to make 13 appearances for the Cheshire County League side that season as he turned out in front of attendances that regularly reached 2,000. 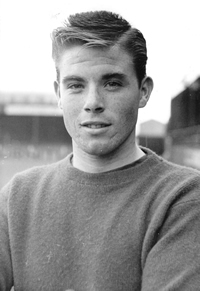 The young keeper signed as a professional at the end of the 1956/57 campaign and was given his first team break, against Rochdale, in April 1958 when he once again replaced Griffiths. His debut, at the age of 17, makes him one of the club’s youngest ever goalkeepers. After gaining the distinction of playing in Chester’s final Division Three North fixture – a 5-1 victory over Accrington Stanley – Brian attracted attention when he was selected to play in the 1958 Welsh Cup Final against Wrexham in what was only his third first team match. The final was played at Sealand Road and some measure of the pressure on the Chester defence can be gleaned from the fact that Wrexham won nineteen corners compared to the home side’s one and it was purely down to a string of superb saves from young Brian that the Blues were able to cling on for a draw. The replay, at Wrexham, saw the home side secure a 2-1 victory and Chester were once again grateful to another string of magnificent saves from Brian that prevented a much larger winning margin. Brian’s performances in the final earned him a start in Chester’s first ever Division Four fixture, against Torquay United, but after the 3-3 draw with Crystal Palace in the following fixture he lost his place in the side. In September 1958 Chester signed the former Welsh international keeper Ron Howells who immediately claimed the number one jersey and restricted Brian to only one further first team appearance. For the next two seasons Brian was a regular for the Reserves in the Cheshire County League but was made available for transfer in November 1960 and moved into Welsh non-league football, with Pwllheli, in summer 1961. Although Brian never established himself as a regular at the club he will always be remembered for his outstanding displays in the Welsh Cup Final.